Cooper visits Alaska with the help of his new friend and guide, Kodi the Moose. Follow their Ultimate Alaska Adventure through the cities of Juneau, Skagway and Ketchikan. The interactive version takes you through Alaska like no other travel guide can, including several of Alaska’s cruise ship tour stop-overs. Hunt through the book to find Cooper’s hidden secrets, or “buried bones”. Touch a picture and learn more about the story along with additional information and silliness. The book also includes an activity section detailing Alaska’s interesting facts, history, maps and activities. By combining the rich imagery used in the print version of the books with an interactive “Where’s Waldo” type feature to see what Cooper hid, readers are guaranteed to enjoy their journey. New interactive elements include over 100 “buried bones”, navigation, and advanced fun fact information with additional imagery. Education and entertainment for children and adults alike! 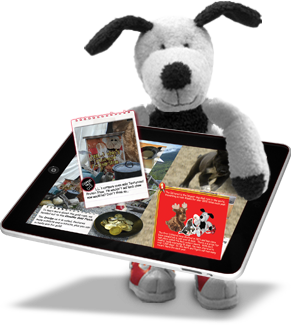 Watch Demo showing Cooper’s Pack Alaska Kids Travel Guide with your favorite traveling stuffed animal, Cooper and his new friend, Kodi the Moose. The video includes features, buried bones and animations. The Cooper’s Pack Alaska eBook is available for the iPad and can be purchased on iTunes.